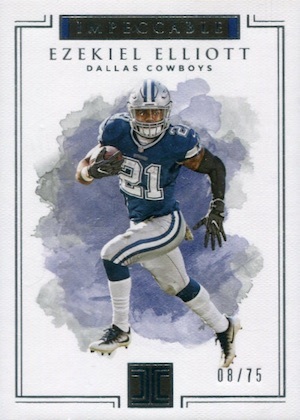 Now in its second season, 2017 Panini Impeccable Football is an early-year delight for high-end NFL collectors. Just like the popular 2016 debut, hobby boxes again include five autographs. At least one of these will be a rookie patch autograph. Base cards, while not specifically mentioned in the initial info, should fill the final three spots of the eight-card boxes. 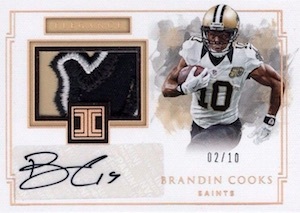 Stressing premium designs and a mix of patches, the 2017 Panini Impeccable Football checklist features both league legends and first-year players. Averaging one per box, the Elegance Rookie Patch Autograph cards display dual memorabilia pieces consisting of helmet and patch relics. These also have more limited versions that substitute NFL logo pieces, nameplates or helmet/glove pairings. 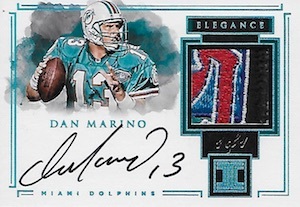 Part of the same line as the RPA cards, the Elegance Retired Patch Autograph set flips to a horizontal layout for former stars. 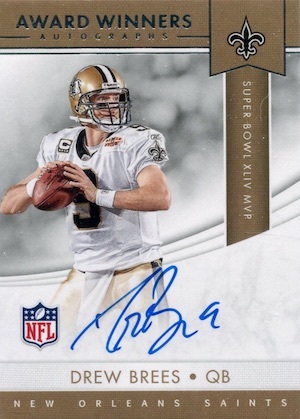 Themed autographs, sans relic, include Impeccable Draft Picks, limited to the player's overall selection number, as well as other editions noting jersey number, amount of Pro Bowls, or other relevant stats. On the other hand, Impeccable Victory focuses on key wins for top players. There are also Dual, Trio and Quad Autographs, plus Cut Signatures. A case hit, the Silver (one troy ounce) and Gold Piece (0.5 troy ounce) cards contain the actual metal embedded into the design. Options include Hall of Fame logos, NFL shield logos and special logo editions for the Cowboys, Packers and Patriots. Troy Brown 2017 Panini Impeccable On Card Auto! 2017 IMPECCABLE EMMANUEL SANDERS ELEGANCE JERSEY AUTO AUTOGRAPH 21 49 Drity! View the 2017 Impeccable NFL auction listings with the most bids on eBay. PARALLEL CARDS: Helmet and Nameplate #/25, Helmet and Glove #/15, Dual NFL Logo 1/1. 48 cards. Serial numbered #/75. PARALLEL CARDS: Silver #/49 (No Brantley*), Platinum #/10, Printing Plates 1/1. PARALLEL CARDS: Gold #/5 or #/3, Platinum 1/1. PARALLEL CARDS: Silver #/25 or less (No Rodgers, Wilson*), Gold #/10 or less, Platinum 1/1. 40 cards. Serial numbered #/15. 20 cards. Serial numbered #/12. Shop on eBay. 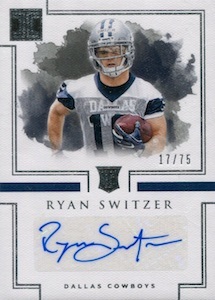 PARALLEL CARDS: Gold #/10 or less, Platinum 1/1, Printing Plates 1/1 (No Randall Cobb*). PARALLEL CARDS: Gold #/10 or less, Platinum 1/1, Printing Plates 1/1 (No Yellow Plate for Eddie Lacy*). Stickers in a $500 box..
Actually this product looks not too bad, but it also looks almost the same like last year (a bit copy and paste in Photoshop by the Panini interns, here you go premium product). Though I like those cards with the Canvas design, the Auto’s look very often too streaky. 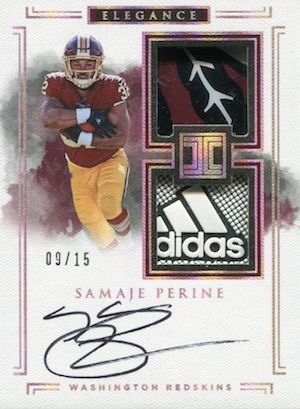 Well if it isn’t a streaky on card Auto, it’s a sticker! As the previous post mentioned, it’s an absolute “no go” in a 500$ premium product. For Team collectors odds are too difficult, if you wanna go for value a group break might be the best option for this product.